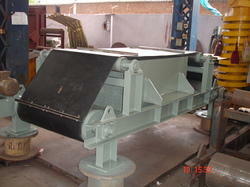 Pioneers in the industry, we offer obms electromagnet from India. We are offering a superior quality of Obms Electromagnet. Elecrtromagnetic suspended type /obms are recommended when the deep field is required. The coils are made out of aluminum strips which creates excellent thermal properties. The coil is protected with 'h' class insulation. The magnetic system can be offered either air cooled/oil cooled as per the requirement of the party. it is recommended when burden depth of product is more than 300 mm ht, also the iron piece is smaller in size with higher frequency. Remove of tramp iron from coal conveyors to prevent pulverizing mills in power station. Recovery of steel from steelworks slag. Cement plant to keep metal out of coal pulverizers. Pulp and paper mill use on wood chips. Foundry -it is used for extracting chills spruces and gaggers from foundry return sand.